Magnolias and Men M/M Romance With a Southern Accent: Fantastic Bargain on a Fabulous Novel! Ever since I published Naked Tails, folks have been after me to write more unusual shifter stories, be they about possums, bears, or even the chipmunk/skunk medi-vac pilots from the book. I'm working on the bears now, and have marked the pilots as "one day." Anyway, as I was saying, off-the-beaten-path shifters fascinate me, and I'm thrilled that dear friend and critique partner, literary hand-holder, etc., P.D. Singer has created a novel-length follow-up to her short romp Tail Slide. The short work is even included in the longer one. I've been privileged enough to get a pre-read, and let me tell you, the book not only met my wildest little dreams, it passed them. Be still my shifter-loving heart! Otter shifters! Woot! Cute, cuddly, mischievous, koi-pond-raiding OTTER SHIFTERS! And not only does Ms. Singer give us otter shifters, she's also made it really easy to get our paws on (pun intended). 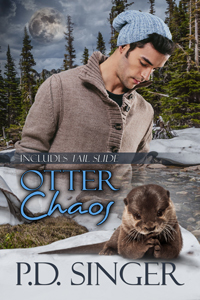 From now until the release date of October 9, get Otter Chaos for only .99 cents. That's right folks, less than a buck. But remember, the sale is only for preorder. After publication the sale is over. Amazon, All Romance eBooks, and Smashwords. My current work features two bear shifters, three wolf shifters, two elk shifters, and one who's a fox. It's my first attempt at menage.